Milaha, a Qatar-based maritime transport and logistics conglomerate, has won the prestigious “Sword of Honor” from the British Safety Council which is awarded to companies that have demonstrated excellence in the management of health and safety risks at work. Milaha was one of 61 organizations worldwide that achieved a Sword of Honor. Prior to competing for the Sword of Honor, Milaha had achieved the maximum five stars in the British Safety Council’s health and safety management audit in the period between August 2017 and July 2018. Yang Ming Marine Transport Corp. was named “Provider of the Year” on 18th July, 2018 by Target Corporation, the second-largest department store retailer and importer of containerized freight in the United States.Yang Ming was also accredited with the “Environmental Ship Index Award 2017” by Marseille Fos Port Authority, said a company statement.The “Provider of the Year” award distinguishes the provider who has demonstrated exceptional operational performance in cooperation with Target Corporation.Yang Ming achieved a score of 99.9% against stated performance goals. ESPO congratulates Port of Dunkerque (France) for obtaining for the first time EcoPorts’ environmental management standard (PERS). Isabelle Ryckbost, ESPO’s Secretary General, handed over the PERS certificate to Stéphane Raison, CEO of Port Dunkerque, during a special ceremony which took place at the port. “I welcome the PERS certification of Port of Dunkerque which has become the ninth port certified with PERS from France. The Port of Dunkerque is clearly a port that puts environmental sustainability on the forefront. RZ Carrier and Rickmers-Line, both companies of Zeaborn Group, have successfully undergone the process of certification of their integrated management system for Quality, Health and Safety and Environment (QHSE) according to the latest standards of ISO 9001:2015 for the Quality- and Process-Management ,OHSAS 18001:2007 for the Health & Safety Management System, and ISO 14001:2015 for the Environmental Management System. Audits by DNV GL took place in Hamburg on 9 and 10 October. 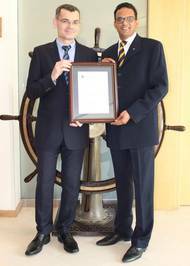 The new certificates will be released for RZ Carrier GmbH & Co. KG including Rickmers-Line GmbH & Co. Emissions inventory shows 2016 was a banner year for green growth. The Port of Los Angeles achieved record clean air gains while moving more cargo than ever, according to the Port’s 2016 Inventory of Air Emissions. Released today, the annual report also shows the Port surpassed its 2020 goal for reducing the health risk of emissions from port-related activity. “Our ports are the engines that power our economy, and they can also be the forces that drive our region toward a greener, healthier future,” said Los Angeles Mayor Eric Garcetti.